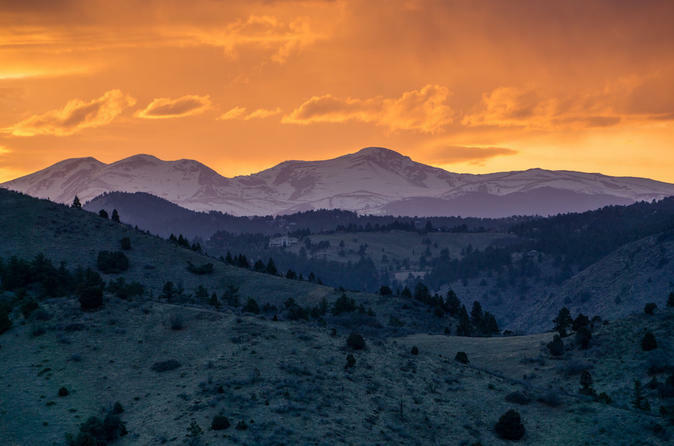 Hike through the foothills of the Rockies with a 3-hour private, guided tour and be treated to a beautiful sunset. Experience Colorado’s backyard with a local and explore some of the best trails in the Denver area. This is rated an easy to moderate hike and can be adapted to your needs. Tour includes water and hotel pickup and drop-off from your downtown Denver hotel. For this 3-hour hiking tour get picked up from your Denver hotel a little before 5:30 p.m. Then make the approximately 30-minute drive to the foothills of the Rockies. For this tour, follow a guide on a well-maintained trail with gorgeous views. This is an easy to moderate hike for about 1.5 hours with no more than 500 feet (152 meters) in elevation gain. You have the option of turning around earlier if you get tired, but your guide will work with you to make sure everyone is able to keep up. Along the hike, enjoy the sunset over the Rocky Mountains. The present-day Front Range is home to ancient mountain ranges, deserts, beaches, and even oceans. While you wander, keep an eye out for wildlife including elk, deer, and birds. Your tour ends with drop-off back at your hotel at about 8:30 p.m.